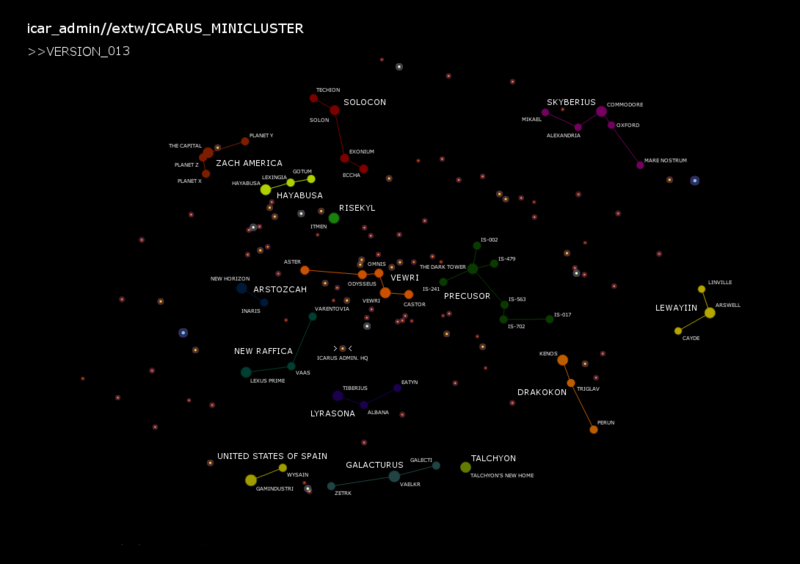 The Icarus Minicluster consists of a small collection of stars drifting about the Milky Way. Among them reside a plethora of human, extraterrestrial, and synthetic civilizations. The minicluster's Icarus Administration presides over them all, providing a platform for interstellar cooperation. Whether you plan to reside long-term, or just pass through, we hope you enjoy your stay! - New Dawn is Here! - IRL RP is Open! Factbook → Legislation by Icarus Administration 1 year 335 days ago . 268 reads. Factbook → Politics by Icarus Administration 1 year 335 days ago . 395 reads. Meta → Gameplay by Icarus Administration 2 years 198 days ago . 113 reads. Factbook → Legislation by Icarus Administration 2 years 51 days ago . 254 reads. Embassies: The Galactic Commonwealth, United Group, The Erviadus Galaxy, The Republic Nations, The Northern Lights, The Embassy, BENEVOLENT EMPIRE, The Bar on the corner of every region, Avadam Inn, The World of Remnant, Matheo, Homelands, AEGIS Alliance, and The Great Universe. Tags: Casual, Democratic, Featured, Future Tech, Medium, Multi-Species, Outer Space, Post-Modern Tech, Regional Government, and Role Player. Icarus contains 13 nations, the 1,112th most in the world. As a region, Icarus is ranked 2,954th in the world for Most Inclusive. 8 days ago : The Stellar League of United States of Spain arrived from Lazarus. 19 days ago : The Federation of Nation M departed this region for Cynosure. 22 days ago : The Unified District of Tycoon of the region Tychrome proposed constructing embassies. 23 days ago : Embassy cancelled between Superiorem Merionem Region and Icarus. 23 days ago : The Lost Kingdom of Demon Catz of the region Superiorem Merionem Region ordered the closure of its embassy in Icarus. 29 days ago : The Stellar League of United States of Spain ceased to exist. 30 days ago : The Federation of Nation M arrived from The Erviadus Galaxy. 31 days ago : The Federation of Baeluros arrived from Lazarus. 32 days ago : Cyprix ceased to exist. 35 days ago : Xinjia ceased to exist. Beep beep to you too! Lewayiin wrote: Well gang, it's Friday. How was everyone's week? Yesterday was a coworkers last day so we all went out, I don't drink but it was still fun. Anyone have any exciting weekend plans? I'm helping a neighbor move tomorrow and I anticipate a long day at work Sunday. My week was pretty chill. Just had classes and stuff. Worked much of today and will be working much of tomorrow, but if that's what I gotta do then I guess I'll be doing it. Lewayiin wrote: Beep beep to you too! Good to see signs of life here. We're interested in getting to know the federations that reside this side of the galaxy. We've yet to set a formal colony in the region. Talchyon wrote: Nice. I like him already. Talchyon wrote: My week was ok. I guess. Today I rest. Tomorrow is busy. That's my life this time of year. Today is fun. Get to travel to district quiz bowl and state band concert tonight. Family things can be fun. Glad for the two for their different events. The Ancient World wrote: How's everyone? Tired. Busy day today and next few weeks are going to be very stressful. Hopefully very rewarding too. I've been alright, nothing out of the ordinary going on. Today's my girlfriend's birthday so we've got a nice dinner planned with my parents and my grandparents. Talchyon wrote: Tired. Busy day today and next few weeks are going to be very stressful. Hopefully very rewarding too. Pretty good. Almost done with school so I'm looking forward to summer.